Oddified - world class tuning services..
Oddified have created some of the worlds leading performance parts, our engine tuning is known worldwide as "simply the best" and we have backed this up with a complete range of diff's, clutches and specialist CNC milled products for many cars. On this page we have listed some of our popular products, simply click the contact link if you need any further information. Would you like to know what Bhp/Torque your engine, or tuning work actually has?. Dyno testing available, please contact us for details. The latest version of the very popular Oddified 6 shoe clutch is now supplied with a very special custom made clutch material available exclusively from Oddified. No other material comes close to the long life, low wear rate, driving feel and stable rpm engagement point irrespective of temperature. 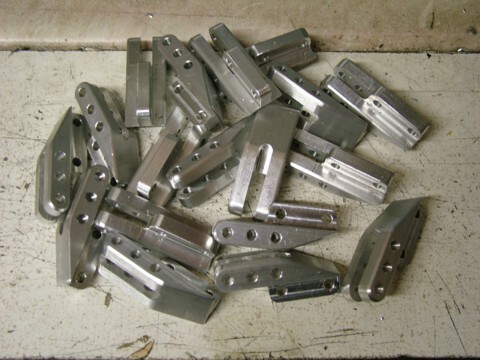 The older ptfe and aluminium shoe options are only available to special order now, the latest material shoes are a direct replacement and are better in every way. 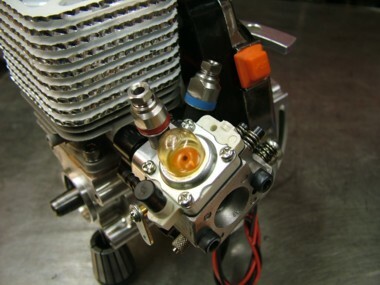 Engines designed for the highest competition in off road racing. Fuel tank extension designed to simply screw on the top of the fuel tank and increase the tank capacity. 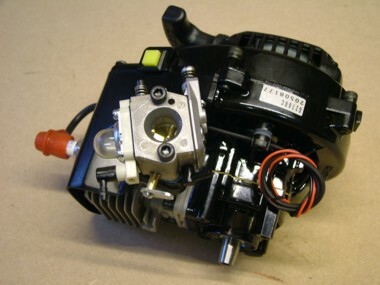 Two sizes available to increase the standard fuel tank from 700cc up to 800cc. 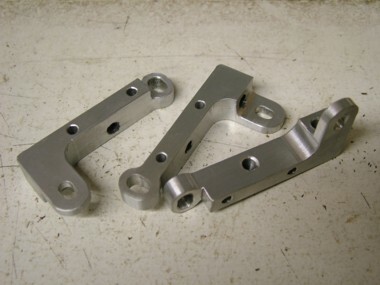 Below are extension pieces for the rear shockers, moving the mounting point further out on the suspension arms. Increased stability and grip without the need to run a roll bar on high grip tracks. Every year through continuous development on the dyno and competition on the race track new and improved specifications for engines are created. With revised porting and modifications making more power and a wider power band than ever before, the latest engines are the best available. 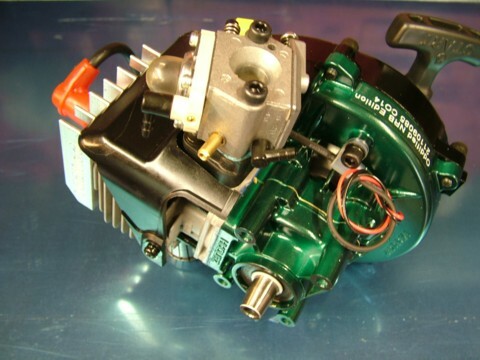 Engines and engine tuning are available in all the engine sizes including 23, 26, 29, and the latest Zenoah 320. Other engines are also tuned, eg RCMK engines, Trevor Simpson reed valve engines along with marine and helicopter engine tuning. Now features 20 user selectable ignition maps to choose from, all tested on the dyno to increase the performance of any engine (standard or fully modified and everything inbetween!). Supplied as standard in all new ecu's but also available as an upgrade for all MK2 ecu's. 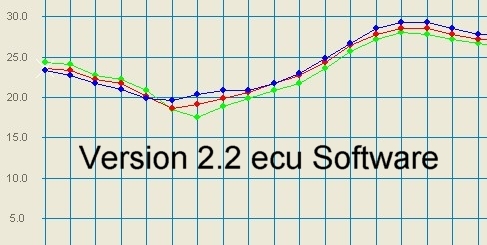 Also has 20 user selectable ignition maps the same as version 2.2 above but all version 3 software has the optional engine temperature input. 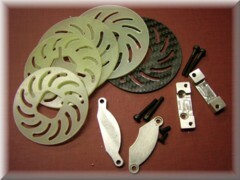 Following many hours of R+D a special racing clutch with 6 shoes has been developed and is now available. Ultra smooth operation in all conditions and longer life than a 3 or 4 shoe clutch. Now available with 3 options of clutch shoe material, the original pure ptfe, aluminium and an all new special filled ptfe version. The pure ptfe gives the smoothest action but can wear quite quickly on heavy cars with high power engines(the shoes are white in colour). The all new filled ptfe is much harder wearing than the pure ptfe but is still smooth to drive out of the corners and doesn't change with temperature like most other types (the shoes are cream in colour). The all aluminium shoe is the most robust and suitable for the most extreme engines and weights of car. It is also the most aggressive on engagement which can make the car more difficult to control. 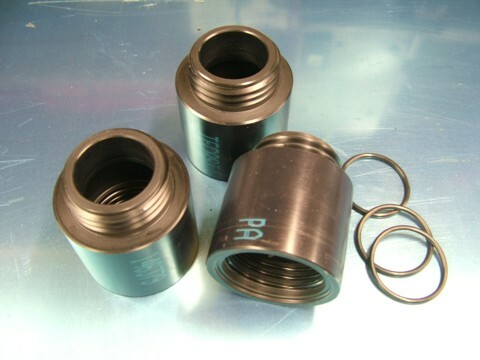 The clutch is also available with any combination of the shoes fitted, eg, 3 ptfe and 3 filled ptfe, 3 ptfe and 3 aluminium(as pictured)which gives the clutch characteristics inbetween the 2 sets used. 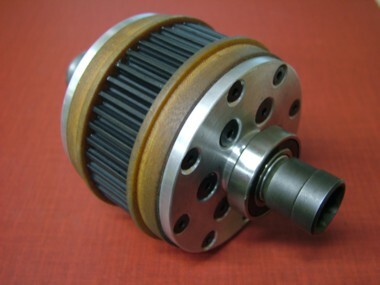 The clutches are available in all widths to suit every car (Fg/Harm, narrow Lauterbacher/Harm, Genius etc). Complete new front diff, one way drive for the front wheels and also torque limiting drive to help prevent drive belts breaking under extreme load (eg landing after jumps etc). 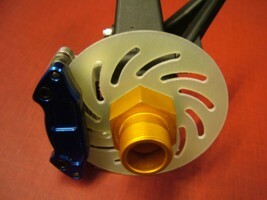 The torque setting is adjustable. Super size brake kit conversion. With huge 85mm disc's the braking is far superior to any other set-up. Note- these can only be used with the large wheels, kit includes a pair of disc's, caliper spacers, bolts and 4 steel brake pads (not shown in picture). Special belt tensioner inserts, reduces belt tension making the drive train run free-er and stops the drive train going tight when the car is hot.These are available to suit both front pulley options (42t and 40t over driven). 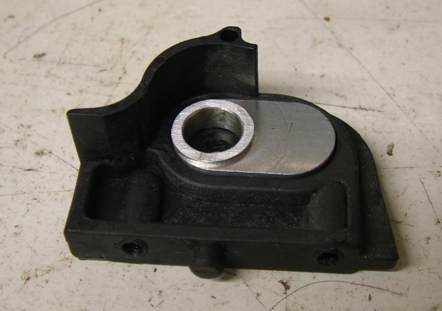 Special engine mount for the Genius XR2 car to better support the engine and prevent the engine crank cases breaking in accidents. 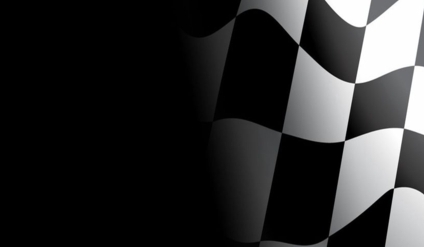 Following many hours of R+D during 2012, the special black spec engines are released for the 2013 season. 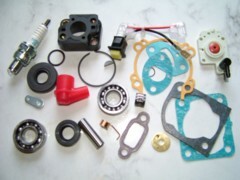 Numerous advances including, black crank case for heat dissipation, knife edge and balanced crank, ptfe crank seals (zero drag and perfect seal), super lightened and balanced flywheel, and revised porting in the cylinder and piston. With more power and torque over a wider power band making them an unbeatable combination. 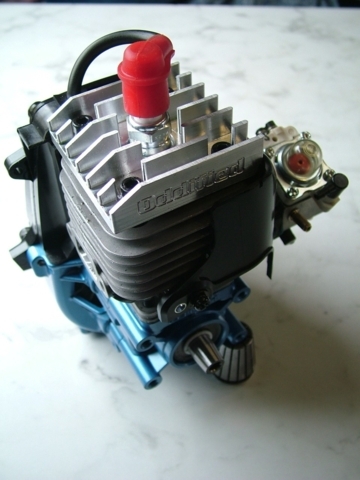 Available in all engine sizes for both On and Off road racing at the top levels of competition. 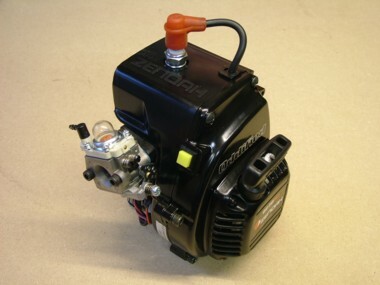 Clubman engines are also available for racers on a tight budget looking for more power at an affordable cost. Marine tuned engines are also available in all sizes and specifications. For more information on all the options available, please contact us. 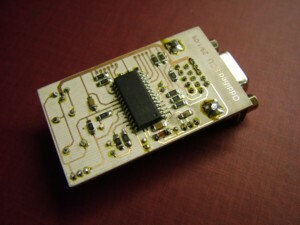 New version 3.0 software enables the Mk2 ecu to have an engine temperature input. 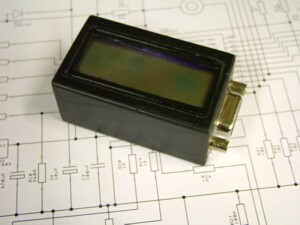 The ecu will then display the current engine temperature, and show the peak temperature reached. It will also record the peak temperature and display it when the engine is started for the next race. 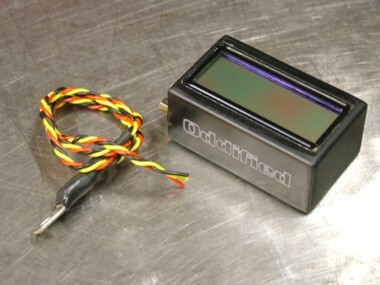 The ecu also uses the temperature input to trim the timing map. Please note;-Temperature input is NOT legal for use in Ifmar, Efra or Brca races. An example of work undertaken:- A custom tuned engine complete with a full nitrous system, ecu controlled injection, programmable throttle and rpm point of activation. 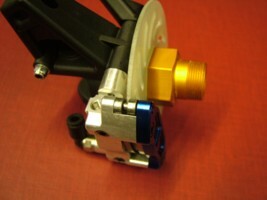 Plus temperature input with timing trim and retard when the nitrous is activated and nitrous solenoid delay. Please note;-I'm sure you'll already know, but this is NOT legal for use in Ifmar, Efra or Brca races!. 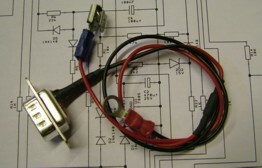 An optional MK2 ecu connection lead designed specifically to allow the ecu to be used on an engine with the high output external ignition coils as used on some tuned engines (eg- Modellsport etc). Please note;- This connection lead is only required if used with the high Voltage ignition/coil systems. When ordering a new ecu, please state which ignition system it is being used with and the correct lead will be supplied. Last 3 previous peak rpm. 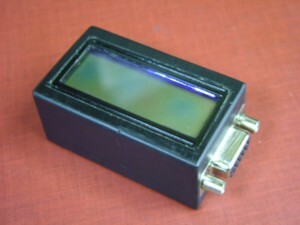 Rpm range/display up to 25650 in 50rpm increments. The number of times the engine/system has been started. User reset option for the total engine running time. Plus of course built in ignition timing adjustment, with more control than the original ecu which means even greater effect/power!. Fail safe built in. Full instructions are available to download here. 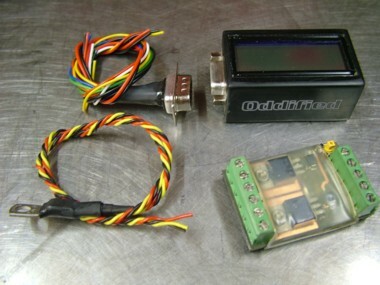 Servo outputs for mixture and coolant control, plus specific timing to suit the demands of boat racing. The software is being developed now!. A complete kit of parts to fit the Harm Mecatech brake calipers onto the front of the HPI Baja car. Large 70mm brake disc's in either GF or carbon fibre, mounting plate and cnc tool steel brake pads for the brake calipers. 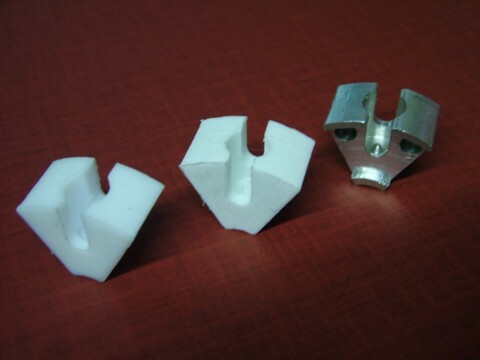 All of the parts are available separately. For more information, contact us. Engine Rebuilds, Servicing and Dyno testing. Any large scale engine, tuned or standard can be rebuilt,serviced and/or tested and set-up (even if it's not an Oddified engine). 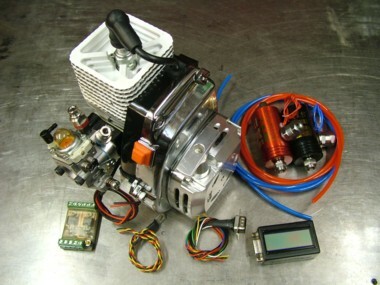 Running in and dyno testing engines with a dyno print out afterwards is also a service offered. 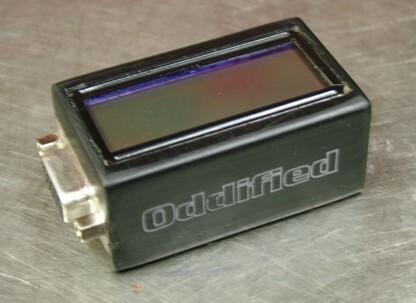 The oddified harm mag diff is totally unique operating principal for model car differentials. 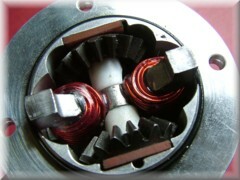 The system works by eddy current being generated in the center coil winding, but only when the car is diffing out. The end result is the smoothest operating diff available and the only diff that can be used with out any changes in any track condition. The diff also works very well in off road cars! 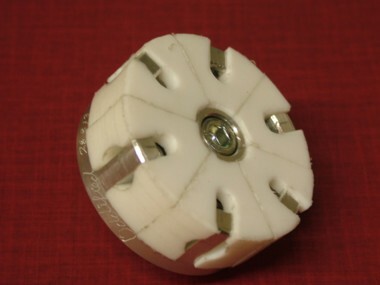 The original harm mag diff (new or old) is modified internally to fit the coil system inside, and the aluminum magnet rings are also pinned onto the output gears to prevent them from coming loose in operation. 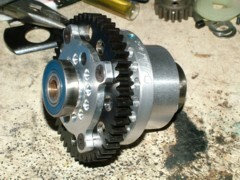 Whilst the Harm Mag diff is no longer available from Harm any older diff can still be modified to the very latest spec. Stop quicker - go faster! These CNC Machined brake disc's replace most manufacturers OE ones, computer designed to give more accuracy and using better material making more feel & control on the brakes. More braking power and they don't change at all between being hot and cold. 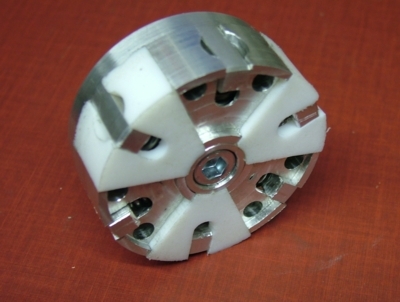 Disc' are available to fit virtually every car, in many different diameters and thickness'. Carbon brake disc's are also available, these give incredible braking power on off road cars, in any condition. 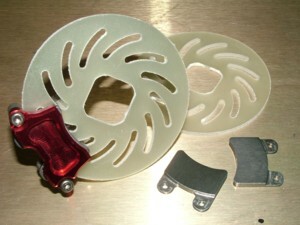 Brake pads are also available to suit many different calipers. 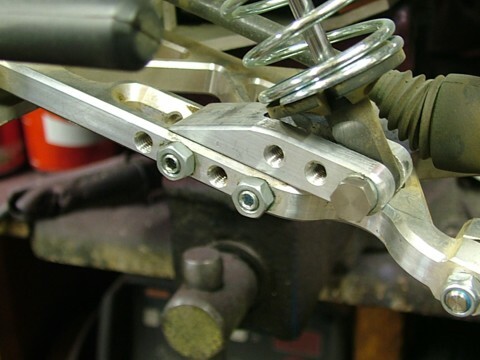 These are cnc cut from tool steel and work in perfect harmony with the brake discs giving far superior braking performance and feel to the brakes. 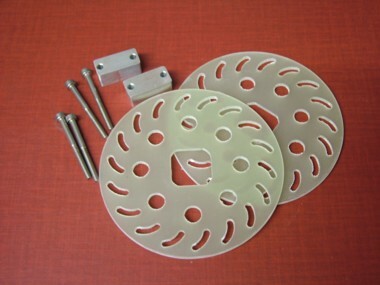 Brake caliper spacers kits and conversion plates are also available. The caliper spacer kits allow bigger brake disc's to be fitted for even better braking and the conversion plates allow other manufacturers calipers to be fitted to various car, along with bigger disc's. Traction where and when its needed. 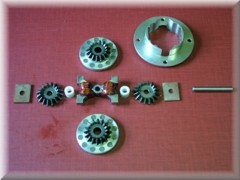 Virtually every manufacturers diff's can be modified to improve their on track performance. There are so many different types available and so many options available to you, please contact us for more specific advice.